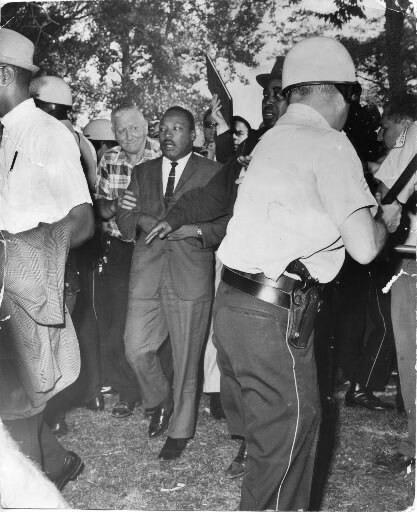 On MLK Day 2014, IMAN and the Chicago Public Art Group (CPAG) are announcing a historic initiative to create a public memorial commemorating Dr. Martin Luther King, Jr.’s march through Chicago’s Marquette Park on August 5, 1966. IMAN staff and volunteers will also be engaged in a community service project, feeding residents and talking to them about this important announcement today between Noon and 2 PM at the IMAN Youth and Arts Wellness Center at 2747 W. 63rd Street. “The MLK Memorial Project will help make the Marquette Park area a Chicago cultural and educational destination that will bring to light a difficult but inspiring part of the King legacy in our city that is often overlooked,” says Rami Nashashibi, IMAN’s Executive Director. Several years ago, IMAN supported students from Gage Park High School and their teacher Victor Harbison as they led the first effort to place a Kiosk in Marquette Park that contained photos and other important documents related to the 1966 march. By connecting community organizations, public schools, religious institutions and neighborhood families with artists, local historians and participants of the 1966 walk, IMAN intends to build a dynamic and expansive team of people who have been laying the foundation for this memorial for several years. “We know how art and the artistic process can bring enthusiasm, vitality and community spirit back to a neighborhood,” says Chicago Public Art Group director Jon Pounds. “The Marquette Park neighborhood is one of the most unique and diverse working class communities on Chicago’s South Side, yet little is heard about this community outside of violence and poverty statistics,” Nashashibi reminds us. There is yet no permanent structure in place to acknowledge 1966’s national march against some of the most vicious and hateful segregationist policies of that time, or the local struggle since then to realize a dignified quality of life for all community residents. The initiative will also launch a local artisan workshop for artists and leaders to hone their creativity and craft, and sell their artwork. Housed in IMAN’s new Youth and Arts Wellness Center, the workshop will act as a hub for artists and provide a vital space for community building, social entrepreneurship, leadership development and nurturing creativity. “This is an idea whose time has come and I can’t wait till we unveil it to the world, on the 50th Anniversary of King’s 1966 march in Marquette Park,” said State Senator Jacqueline Collins who led the fight for resources to launch this project.